"This drink is actually considered a shooter, meaning don't hold back, guzzle it down. But be careful because of the 151, that is how it is able to catch on fire, hence the name." Fill a pint glass half full of beer. Pour the amaretto into a standard shot glass. Carefully pour the 151 proof rum on top of the amaretto so that it floats. 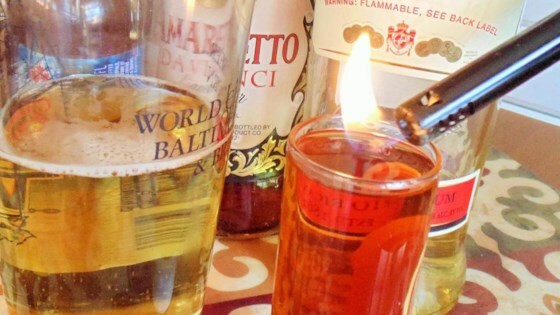 Carefully light the shot on fire by touching with open flame. Drop the lit shot into the half full glass of beer and slam. Yeah baby!!! This is a fun and tasty party drink. Goes down smooth and fast!! Neato pete-o! If you love Dr. Pepper cola, you will love this drink. It is a big hit at the bar I go to. Be warned though.... It is not for the light drinker. This is a good recipe, but my version uses rootbeer schnapps instead of amaretto. Be careful, they are powerful. If you want to remember the party don't drink more than two!! Love these! Had them for my 21st birthday (forever ago...) and as often as possible now. As far as crazy shooters, this one is right up there and does the job pretty good...the Wifey has to be carfule how many she consumes lol. Very good. Surprizing that this actually works together. I wouldn't drink them all the time, but for shock value.....it was worth it. OMG, I totally forgot about these! I used to love them back in the day! Might have to give it a try again!! They really taste like Dr. Pepper!